"I made these the other day after buying some thighs and wanting to do something different with them. Next time I might try putting 2 asparagus stalks in each roll." Preheat oven to 400 degrees F (200 degrees C). Grease a baking pan with cooking spray. 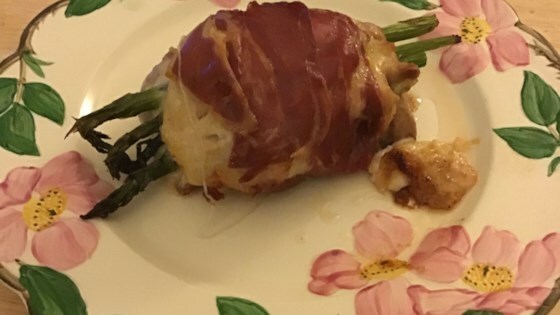 Wrap half a piece of provolone cheese around 2 asparagus halves. Wrap 1 chicken thigh around the cheese. Wrap 1 slice of prosciutto around the chicken thigh. Transfer to the prepared pan. Repeat with remaining provolone cheese, asparagus halves, chicken thighs, and prosciutto. Sprinkle Italian herbs on top. Bake in the preheated oven until an instant-read thermometer inserted into the chicken reads at least 165 degrees F (74 degrees C), about 40 minutes. You could substitute any kind of cheese you like. This was a simple and very good recipe. I did it exactly as specified except that I used parchment paper instead of spraying the cooking sheet.